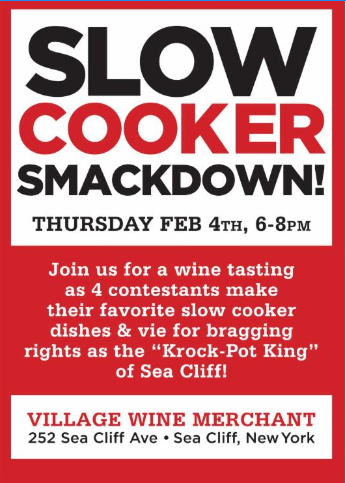 Upcoming Meetings and Events: Thurs 2/4 - Slow Cooker Smackdown, Village Wine Merchant, 6-8 pm; Fri 2/5 - Chinese New Year Celebration, Glen Cove Senior Center, 1 pm; Sat. 2/6 - Cookbook Club at the Sea Cliff Library, 1pm. 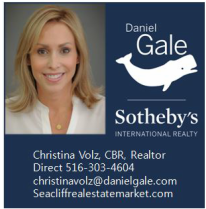 Mon 2/8 Sea Cliff Board of Trustees Meeting, Village Hall, 7 pm; Wed 2/10 - Sea Cliff Planning Board Meeting, Village Hall, 7:30 pm; Thurs 2/11 - North Shore Board of Education Meeting/ Budget Review, High School Library, 7:30 pm. The Band rehearses for Cuba tour this past Monday evening. Saturday afternoon, January 30, forty or so Sea Cliff residents gathered at Still Partners Pub to celebrate the birthday of Scotland’s most beloved poet Robert Burns . ​Organized by Scotophiles Rob and Nedra Bleifer, this event which is observed worldwide had the inimitable Sea Cliff touch. There were tartan crafts for the many children that attended, lavishly costumed guests, party favors flown in from Scotland, and culinary delicacies for all- provided by Jill, Paul, and Ava Haining and Dan Roth, proprietor of the pub. Paul Haining in full piper garb led a spirited march through the tavern and boisterous readings of Burns’s poetry followed. 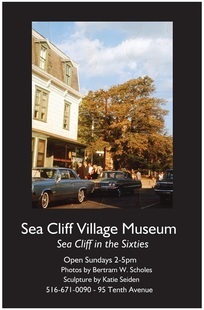 All agreed that this will surely be an annual Sea Cliff event. January 29, 2016 -- Battling a blizzard of historic proportions, nine workers of the Sea Cliff DPW worked around the clock last weekend clearing the Village's 22 miles of roadway that were being blanketed by two feet of snow. The initial storm crews worked 24 hours with intermittent breaks. ​"Eight were on the road plowing and one in the yard repairing equipment and keeping the yard accessible, " said Village Administrator John Mirando. READ MORE. 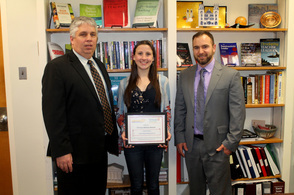 . .
North Shore High School is proud to display the work of six AP 2D Design students. Each artist is showing four images from their AP 2 D Design portfolios. In AP 2D Design, students are required to create three distinct portfolios that will be judged by the College Board. All portfolios follow strict and rigorous standards that among other things demand originality, engagement of the viewer, accomplished use of design principles and technical competence. Please visit the Sea Cliff Library February 1st through the 29th to see the achievements of these six hard working student-artists: Julianna Damiano, Aliesha Giambrone-Hatalovsky, Amelia Herrera-Chappell, Carly McGowan, Francesca Orban, Jacey Vermeersch. 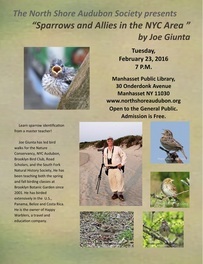 Joe Giunta will present “Sparrows and their Allies”. Learn sparrow identification from a master teacher. 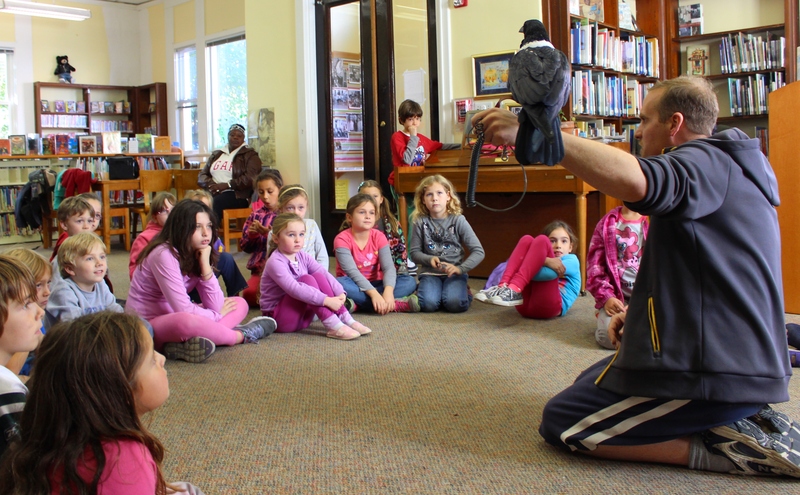 Joe Giunta has led bird walks for the Nature Conservancy, NYC Audubon, Brooklyn Bird Club, Road Scholars, and the South Fork Natural History Society, He has been teaching both the spring and fall birding classes at Brooklyn Botanic Garden since 2001. He has birded extensively in the U.S., Panama, Belize and Costa Rica. 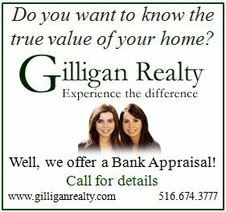 He is the owner of Happy Warblers, a travel and education company. There will be a North Shore Board of Education on Thursday, February 11, 2016 at 7:30 p.m. at North Shore High School Library. The seven trustees and Schools Superintendent Dr. Edward Melnick will continue their line by line review of the 2016-17 budget proposal. Upcoming meetings will take place on the following dates at 7:30 p.m. (unless noted otherwise) 2/25, 3/10, 3/31, 4/14 (Budget Adoption), 4/20 (Wednesday, Meet the Candidates Night in HS Cafeteria at 8 PM), and 5/5 (BOE Town Meeting/Budget Reading). The Budget Vote/Election of Trustees will take place on Tuesday, May 17, 2016 at North Shore High School from 7 AM-10 PM. If you would like to contact the North Shore Board of Education, please email nsboe@northshoreschools.org. ​This January 2016 marked the time for our North Shore Middle School musicians to take the stage and fill our hearts with their harmonious sounds. While it was cold outside, their warm voices and melodic sounds left us with a feeling of joy and happiness. A perfect way to start the New Year! Thurs 2/11 - Copacabana Night!! !